Sticking with the Thomas Keller theme, I made this dish for Sunday dinner. As with the chicken, brining the meat for 10 hours or so before cooking is key. After the pork reaches the target temperature and comes out of the oven, it needs to rest for about 30 minutes before cutting and serving. This provided the perfect window to roast some spring vegetables (baby carrots, new potatoes, pearl onions, radishes, and asparagus) and make a salad to serve with the pork. At least 6 hours but no more than 10 hours before mealtime – add the pork to the brine (in a container large enough to hold pork fully submerged in the brine) and refrigerate for between 6 and 10 hours. If you leave the meat in the brine for any longer, it will become too salty. 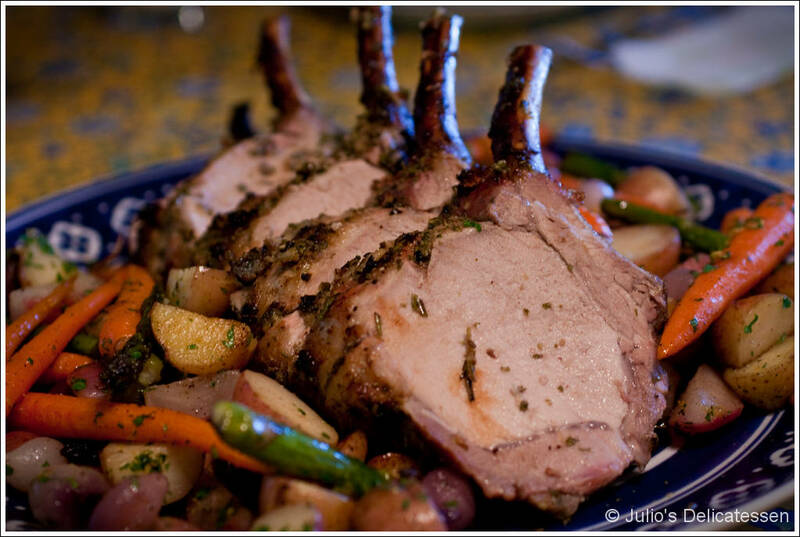 Prepare the pork – remove the pork from the brine and rinse under cold water. Pat dry with paper towels. Score the fat, making a criss-cross pattern (with lines about 1” apart) being careful not to cut all the way into the meat. Use butchers twine to tie the roast between each of the bones. This will ensure the roast maintains its shape and cooks evenly. Make the rub – grind the cloves and peppercorns in a mortar and pestle until finely ground. Use a microplane grater to grate the garlic and then zest the lemon into the cloves and peppercorns. Add a large pinch of kosher salt and mash everything to a smooth paste. Add the herbs and mash some more until the herbs are well incorporated into the paste. Juice the lemon and add the lemon juice and oil to the paste. Preheat the oven to 350 degrees. Set a roasting rack in a roasting pan. Massage the rub into the meat, taking care to get it into the scores on the fat cap. Place roast in oven and roast until the meat reaches 135 to 140 degrees, about an hour and 15 minutes. Remove the pan from the oven, cover the meat with foil, and allow to rest for 30 minutes. Cut into chops, sprinkle with sea salt, and serve.